Behind that lone, tranquilly drifting jellyfish costume is a monstrous predator. There is an unstoppable jellyfish invasion in the horizon, and even now, they are changing ecosystems, stinging thousands of people, killing every other organism in the seas, and causing millions of dollars’ worth of damage. Jellyfish swarms devastated the salmon population In Ireland with their toxins, where 120,000 fish were reduced to floating mass overnight. They clogged a nuclear power plant in the Philippines, plunging 40 million people into darkness and brought on the fall of the human population by slaying thousands innocent souls each year, earning themselves a nickname—the gelatinous assassins. 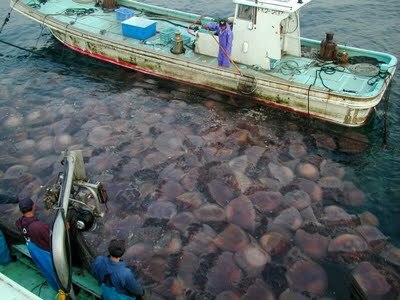 The “jellyfish stable state” phenomenon is approaching, and jellyfish will rule the oceans. This matter is not to be taken lightly, and immediate action should be taken against these bulbous organisms. Otherwise, the only thing we will be eating in for seafood might be jellyfish. HI GLORIA. great use of descriptive words (good word choice). this topic is very unique and the idea is very fascinating! i can hear your voice clearly when you say phrases like “this matter is not to be taken lightly,” showing that you are against jellyfish “invasions.” In terms of grammar and your conventions, this piece is very well done. Sentence fluency is also pretty neatly done, except the sentence “They clogged a nuclear……the gelatinous assassins,” may be a bit long. Your essay is also very well organized, with three paragraphs: one intro, one conclusion, and one body paragraph to present your analysis or reasoning. Good job! Thank you Jeffrey! I’m glad you find this topic interesting!